From African American Expressions. We are so pleased to be offering the musical art works of Thomas Blackshear II. Just in time for Black History Month! What a perfect gift for Jazz lovers and guitar players. 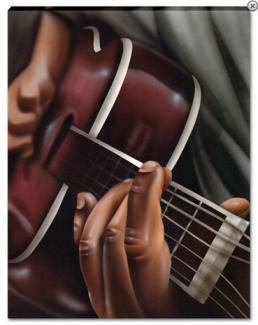 This very handsome Close Up focusing on a guitarist's hands playing his instrument is a favorite of African American Expression's Canvas Art and will grace any wall in your home. It measures 20" x 16."